I have to say, I wasn’t really in the mood to read a memoir about the Alzheimer’s journey. 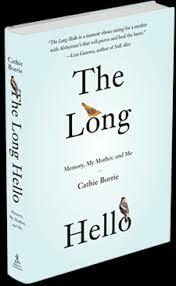 But a friend recommended The Long Hello and I sat down to leaf through it. Four hours later, after both tears and laughter, I had completed the lyrical journey, an artful weaving of rational recall and poetic pouring. I could see and feel Cathie Borrie, the author, and I felt I knew her fanciful, magical, distracted, needy, exhausting, interesting mom. Cathie’s honesty and her ability to capture the intricate connections inherent in this dementia journey were like walking a familiar road through a mysterious jungle. This book is a burst of beautiful writing anchored by deep poignancy and meaning. 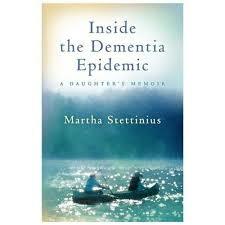 I also really enjoyed Martha Stettinius’ Inside the Dementia Epidemic: A Daughter’s Memoir. Meeting Martha and her mom on the pages of her searching memoir was like rediscovering old friends. I identified with Martha and I was also caught up in her story. I was moved by her struggle to truly care for and take care of her mother, while still preserving her soul and her family life. Martha did a great job of creating a compelling and readable story, while offering a wealth of practical tips and resources. Several weeks ago, I wrote about my first visit to an Eden alternative home, the magical Sierra Vista in Santa Fe. The founder of Eden Alternative is Dr. Bill Thomas, who is one of the pioneers in making dementia care more home-like and person centered. 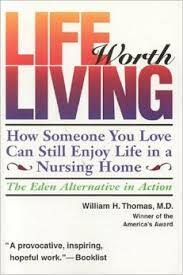 His book, Life Worth Living: How Someone You Love Can Still Enjoy Life in a Nursing Home – The Eden Alternative in Action, is rich with ideas for care facilities. Home care partners can use his concepts to make their household even more creative and welcoming. As a bonus, Atul Gawande wrote about Dr. Thomas, in his fascinating book, Being Mortal. You’ll be inspired by Dr. Thomas’s innovation and his tenacity. It’s not often that you read a book about dementia care and laugh. But when Mara Botonis wrote about carefully laying out supplies for a creative arts project, only to have her loved one staring out the window, then studiously plucking lint from his sweatpants, I had to laugh. I could see my beautiful mom doing exactly the same thing. Mara’s book, When Caring Takes Courage: A Compassionate, Interactive Guide for Alzheimer’s and Dementia Caregivers, is all about making the most of our moments together. Mara knows about dementia from her career in senior living and she has taken the personal dementia journey with her beloved grandfather. 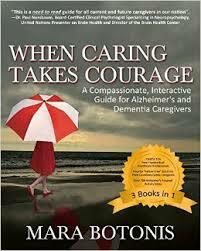 She orchestrated the book to make it easy for the exhausted care partner to problem solve and get instant help. She offers activities and projects for a range of abilities and situations. 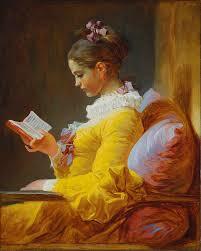 What books are spurring you onward these days? I’m immersed in writing my new book, tentatively titled Creativity in the Land of Dementia, so I’m focused on the topic in all its forms. The great news is that there are so many amazingly imaginative people out there, making the world a more connective and creative place for those living with dementia, their care partners, family, and friends. Which means, making the world better for all of us. I’ve been reading and rereading Vivian Gornick’s “The Situation and the Story.” One of the very best books I’ve read on personal writing.